Winter is halfway done in terms of the accumulation season for glaciers in the Sierra Nevada-Cascades of Northern California to the Coast Range of Southern Alaska. The entire region has experienced a warm winter, with dryness most pronounced in California. 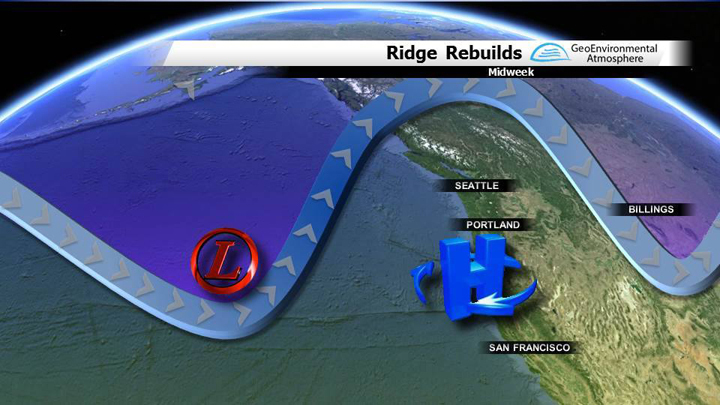 This has been caused by a persistent blocking ridge along or just offshore of the west coast. The feature may disappear for a few days, but always has rebuilt. To the south the snowpack in the Sierra Nevada is 20% of normal and the lowest seen. 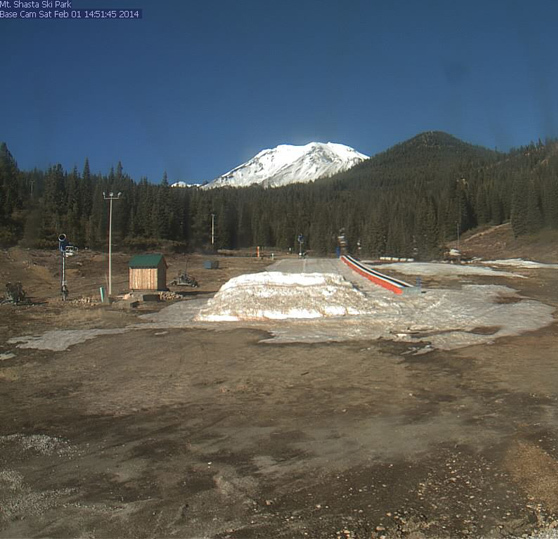 Pictures like that of the Mount Shasta ski park look more like June 1 than February 1. Mount Shasta Snow Park webcam images from Feb. 1 looking toward Mount Shasta, above and below. 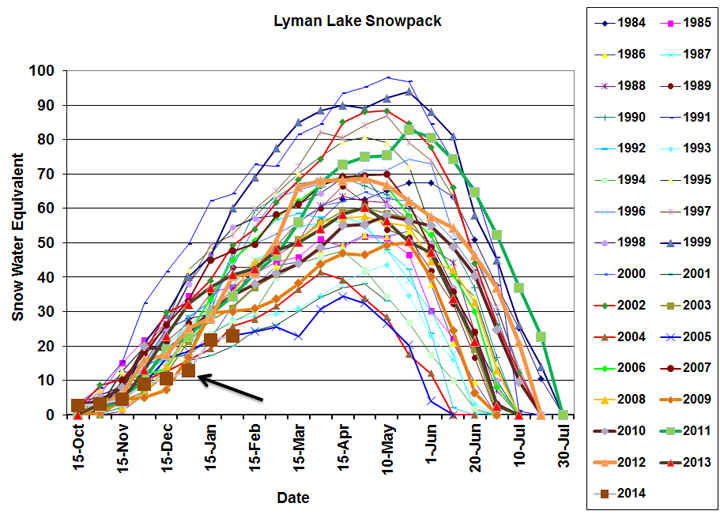 In the North Cascades of Washington where we have measured glacier mass balance every year for 30 years, the snowpack is better, but as seen in the comparison of snowpack at two USDA Snotel stations at Stevens Pass and Lyman Lake, snowpack is near the record low of the last 30 years. At the Snoqulamie Summit ski areas 70% of the terrain is open, but all nordic trails are closed due to lack of snow. The result hikers heading into one of the glaciers we work at on Mt. 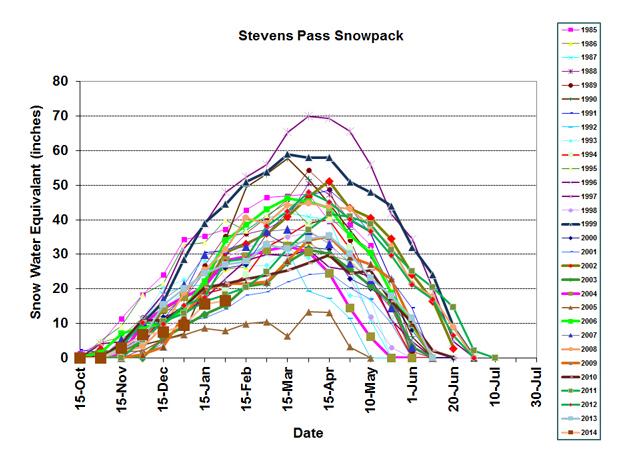 Shuksan experienced late January snowpack the same as we saw in August of 2011 the best snow year since 2000. January 2014 pictures below are from Chad Straub posted at jebsjourneys.com, while the August 2011 images I took. Locations of images are along same trail in quite close proximity. Snow depth and snow water equivalent are 50% of normal. However, the deficit is 20 inches of water equivalent, which is an amount that just cannot be erased even by a wet late winter. The deficit increases at lower elevations as the view across Baker Lake from an elevation of 2500 feet in the Mountain Hemlock zone indicates, marginal snow until 3500 feet, last picture in gallery. In the Vancouver area Grouse Mountain and Cypress Mountain ski areas have had just over 100 inches of snow, well below average. Further north into Alaska we have heard how warm it has been even to Nome. On Monday, January 27, the mercury in Nome hit 51°F under sunny and clear skies. With this astoundingly high temperature, Nome not only set the all-time high temperature record for any day in January since weather data keeping began in Nome in 1907, but also tied with a five-month high temperature record held on November 1, 1926 (Diana Haecker, Nome Nugget). However, it has not been as dry as storms have been diverted in north around the blocking ridge that has kept the west coast dry. Snowpack around Juneau, Alaska is low at the base of Eaglecrest ski area, leading to closure of the lower nordic loop, but not at the summit where the depth is 124 inches. At Alyeska Ski area near Anchorage the 295 inches of snow this year is good, but the warm temperatures have left only 2 inches at the base and a number of closed runs. This will lead to limited snowpack low on glaciers, but snowpack may be adequate higher on the glaciers. 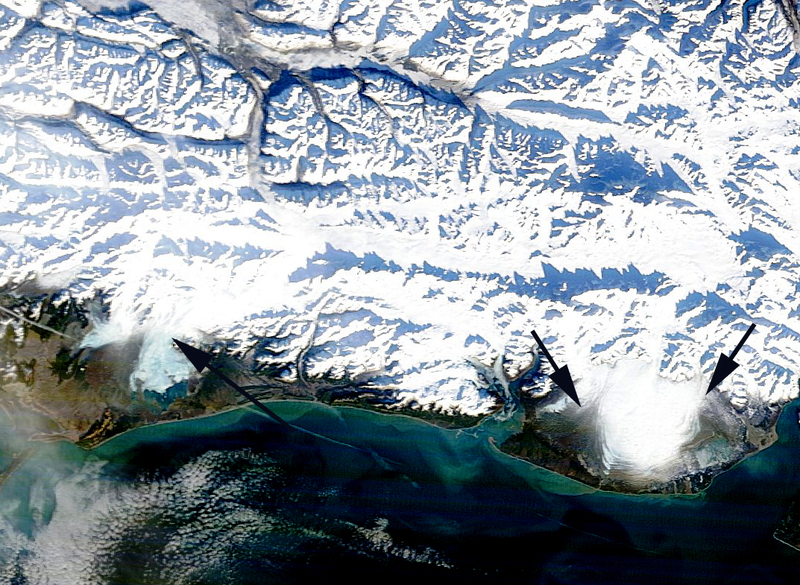 On Feb. 1 the snowline is evident on the two largest glaciers in Alaska, Malaspina and Bering Glacier (black arrows) in MODIS imagery at 600 m. My first year working on glaciers in 1981 was a warm low snow year in Juneau, but at 6000 feet on the Juneau Icefield snowpack was above average. It is evident from the Vancouver area south to the Sierra Nevada 2014 will not be a good year for glaciers, north from Vancouver it is not as clear yet. This entry was posted in Glacier Observations and tagged 2014 low snowpack california, glacier snowpack, low snowpack 2014 north cascades. Bookmark the permalink. It’s a bad, bad year, no question about it. Are you guys tracking any of the Shasta glaciers, or anything in the sourthern cascades for that matter? No I have enough trouble keeping up in the North Cascades and southeast Alaska. 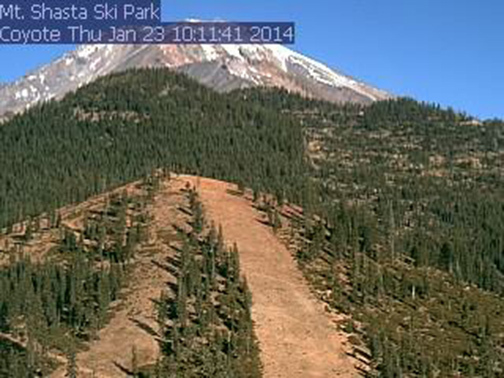 Mount Shasta has had some good winters in the 2009-2012 period, but this will make two straight difficult ones. The common story I had read a few years ago was that Shasta was a good example of one of the few glaciers that was holding a steady mass balance, due to increased winter precip. offsetting the increased melt rates, but I haven’t kept up on it since then.